Old School Ron: What's been with you since the beginning? What's been with you since the beginning? I thought I might share the one card that's been with me since the beginning. We all have that one card. It doesn't matter if you've been playing for twenty years or twenty days. It may not have been our "first" card, but it's the one that holds the strongest memories. Mine is no different. 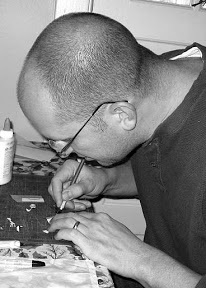 Going through the Old School Blogroll this weekend, I came across a great piece on Gunnarson's Blog that took me down memory lane to those days when I first started playing Magic all those years ago. It's what prompted me to share this story. While I don't remember exactly how I got into playing Magic back in those early days, I do have certain memories that stand out as though they just happened yesterday. One of those is spending countless afternoons playing game after game against my best friend in my living room. He had a brutal blue/red deck and it was everything I could do to barely keep him in check. Forget winning. We'd pull the coffee table up, I had the couch and he'd drag the chair over from across the room. We'd battle it out for hours as the afternoon became late night. Both of us unaware of the time passing... completely engrossed in our games. Most of the time I lost. On a rare occasion I would come so close to winning. Once in a blue moon I would pull out the dramatic win by the seat of my pants. Those were the days. I made it a point to never let him forget the games I did win. 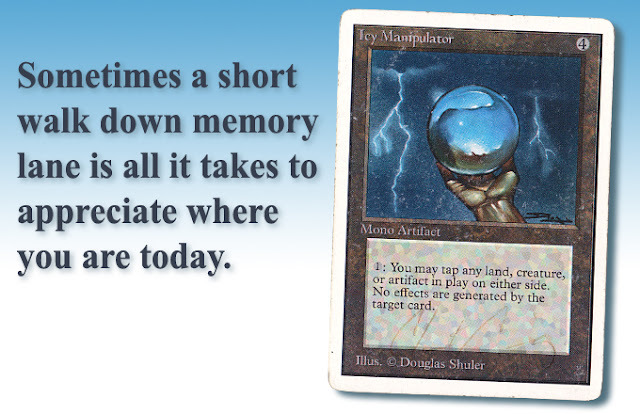 The one card that brings all those memories back is my Unlimited Icy Manipulator. She might not be much to look at now after all the years of play, but I love her. She's seen countless games, been in storage for years and then framed on my wall for years following that. Only recently has she been removed from her display, sleeved up and put back into play. It's the first card I specifically went out and bought. In addition to all the memories it carries, it marked my beginning into deck "building" in the sense that I started buying the specific cards I wanted to have in my deck. I don't remember what it cost. We both had one in our decks. We'd both do our best to piss the other one off by using it to it's maximum potential. What else is an Icy used for anyway? It always had a place in my deck. I don't even remember if it helped being in there or not... it pissed off my friend and that was good enough for me. He'd cast Ball Lightning and I'd tap it the moment it came into play. I probably enjoyed doing that more than I should have. I remember when Icy Manipulator was reprinted in Ice age. At that point I was getting out of the game and I remember comparing the new one to the one I had. I didn't want anything to do with the new one. The "original" one had way more character in my mind. It was in those last few days before getting out of the game that I got my friend to sign my Icy for me. He was going one direction in life and I was going another. Little did we know those would be our last games of Magic together. I can still make out his signature out on the bottom of my card. IMAGE: WotC Card (Icy Manipulator).